RIO DE JANEIRO, BRAZIL – Although there are still more than two months before the official winter season arrives in Rio de Janeiro, it’s already possible to feel the cooler weather setting in as we head into South America’s autumn. For many Cariocas this time of the year is synonymous with going out to update the wardrobe and buying long-sleeve t-shirts, coats, jackets, scarves and maybe even boots. Marisa has over a dozen store outlets around Rio for women’s clothes, photo courtesy of Gabriela Pacheco. It might seem strange for those who live abroad and are accustomed to harsh winters and snow, but for the people of Rio, who are used to temperatures of up to 40°C (104ºF) in the summer, anything below 20°C (68°F) is very cold. So they take the opportunity to put their bikinis and flip-flops aside and wear their warmer clothes. The stores, of course, follow the fashion and are already beginning to display their winter collections. As this particular type of clothing is only used a few times a year, many people prefer not to spend a large amount of money and therefore it’s perfectly possible to find nice outfits for good prices. According to Ana Carolina Soares, author of the blog Hoje Vou Assim Off, where she shares good bargains, fast-fashion stores are a great option when looking to buy clothes and accessories as they have reasonable cost-benefit ratio. “If you’re looking for something cheap go to Marisa, C&A and Forever 21,” said Soares. At C&A, for example, leather boots range between R$79 and R$209 and coats of different styles are available from R$49. At Renner, another famous fast-fashion store with outlets all around the city, it’s also possible to find trendy scarves for R$39. 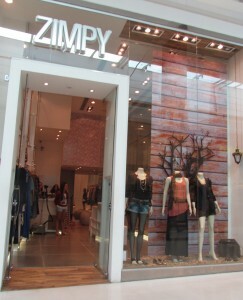 Zimpy is a trendy store with several locations in Rio, photo courtesy of Blog Carioca de Estilo. These are traditional names in Rio’s fashion history, and brands that make good quality, fashionable clothing with unique, colorful prints and an impeccable fit. Yet as the famous proverb goes, ‘everything has a price’; and it’s no different in this case. At Totem the average cost of a jacket is around R$250 and long-sleeve blouses range between R$198 and R$318. Yet, if saving is the main goal, visiting outlet stores of famous brands can be worth it. Many of them are concentrated at Rua Santa Clara, in Copacabana, at numbers 33 and 75. Zimpy, Espaço Fashion and Maria Filó are just some of the stores with trendy outfits for women. For men, nice options are the Armadillo Off at Shopping Nova América and Aviator at Shopping Iguatemi, both situated at Zone Norte (North Zone).